Our outside mounted window signs are designed to be applied to the outside of your store front or vehicle windows. Since these are all custom window signs, you can put whatever you like on them - your company name, contact information, pictures of your products, or anything else you'd like to catch your customers' attention. We offer 3 types of different types of outside mounted window signs, depending on whether or not you would like to be able to see through the sign. Perforated window signs are perfect for store front or vehicle windows that you need to be able to see out of or want to allow light in. The peformated vinyl has tiny perforations, or holes, in the material that allow you to see through the perforated window sign clearly from inside, as if the sign were not even there. In most states, it's the law to use perforated vinyl graphics on the rear windows of your car so visibility is not reduced. For windows where visiblity is critical, we do recommend laminating the peforated vinyl with optically clear laminate from 3M. The reason being that water tends to pool in the perforations of the vinyl if it's raining or snowing which blocks visiblity. The optically clear lamination prevents this from happening. The table below shows the different quality levels and price points that are available for our perforated vinyl window signs. 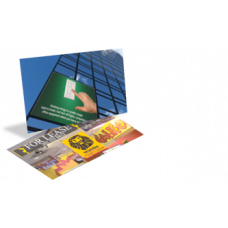 Our outside mounted window signs are cut down to size for no additional fee. Lamination is available for added protection for your window signs. Optically clear 3M laminate is highly recommended on perforated vinyl window signs that are going to be place on windows where visibility is critical. If you have any questions, please contact one our account executives for help. We will ship your outside mount window sign order in 3 business days from the time we receive your order and final print-ready design files, or proof approval if we are creating the design. Faster turn-around is available if needed, but rush fees may apply. Several shipping options from Ground to Priority Overnight are available to ensure your signs arrive on or before your due date. Contact us if you have any questions.